Audio Clips are a special version of the Sampler channels. The purpose of Audio Clips is to hold the samples displayed & triggered in the Playlist where they can be sliced and arranged as required. If desired, Audio Clips can be triggered from the Step Sequencer or the Piano roll, although this does raise the eyebrows of the program developers who prefer you use Sampler channels for that. To load samples as Audio Clips drag and drop your samples on the Playlist. NOTE: The view modes (Stereo, Combined and Spectral) are set from the Channel Settings, Preview window, Right-click options. To load a sample in an Audio Clip Channel drag and drop your sample from the Browser (or external File Browser) and drop it on the Playlist. If you drop your sample on the Channel Rack you will create a Sampler Channel. While both Audio Clips and Sampler Channels look similar Audio Clips only have the SMP and MISC tabs on the Channel Settings due to their main purpose being to feed the Audio Clips visible in the Playlist. See the Audio Clip Menu section for more on-Clip options. Zero-Cross - Slicing & resize edits will be made at the nearest zero-crossing to the slice point. Useful for avoiding clicks at the slice location. NOTE: This option can interfere with your ability to slice at specific locations, as the nearest 'Zero Crossing' will be used. Stretch - When the left or right edge of the clip is selected and dragged the clip will be stretched according to the Audio Clip Time stretching settings. See the section Working with the stretch/pitch functions for more details on synchronizing/beatmatching audio clips to the project tempo. Make unique & Make unique as sample - With Audio Clips the original audio file is re-used in the new Audio Clip channel. Alternatively use 'Make unique as sample' Clones the original Audio Clip AND clones the sample file on disk. Use this when you want to physically edit the sample data and change it in some way. Autodetect slicing - To split an Audio Clip into beats using its integrated BeatSlicer, open the clip menu (see the mouse pointer in the main screenshot above) and select Chop > Dull / Medium or /Sharp to auto-detect beats. Region slicing - To split an Audio Clip into regions, open the clip menu and from the Chop into menu select Regions (if the wave doesn't contain regions, this command is disabled). 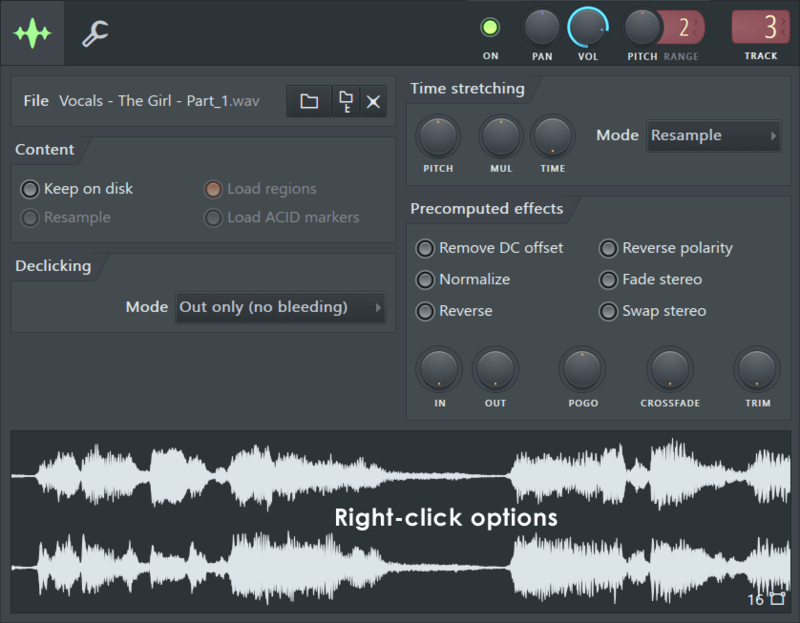 See the Sampler Channel Settings - Declick options to learn more about the special declick features that are available when an Audio Clip is sliced. Save as - Save the sample with the option to rename. Edit - Open in Edison Audio Editor. Spectrum view - Display waveform in Playlist and Preview panel in spectral mode. In this view frequency (20 Hz to 20 kHz) is displayed on the vertical axis, brightness represents intensity of the specific frequencies with time plotted on the horizontal axis, as normal for waveform views. For more detailed spectral waveform analysis use Edison. Multichannel waveform view - Display waveform in Playlist and Preview panel in stereo mode (assuming the sample is in stereo). NOTE: This mode is incompatible with Spectrum view. Loading - Each time a new sample is dragged and dropped on the clip-track area of the Playlist, a new Audio Clip channel is created. NOTE: Drag an audio file (from the Browser, for example) and drop it on the Track label area to auto-create an Audio Clip and auto-name the Clip track to match the file. Clip selector - Each sample placed in an Audio Clip channel becomes available in the Clip selector, list of items that can be inserted into the Playlist. Auto alignment - The Audio Clip will be aligned to the Playlist bars if a Downbeat marker is set in the source .wav file (see Edison region markers for details on adding a downbeat marker). Stretching & tempo-sync - Tempo information included in the .wav file may cause the clip to be stretched to fit the current project. The tempo information can be set/deleted using Edison's Sample Properties dialog. The load behavior also depends on the Read sample tempo information option in the General settings. If this information is incorrect, as often happens with random files downloaded from the internet, you will be scratching your head wondering why your Audio Clips sound like a 'dying duck in a thunderstorm'. Channel Grouping - All new Audio Clips are inserted in the dedicated Audio Clips group (for more information on groups, see Step Sequencer). It's a good practice to keep the Audio Clips in separate groups, as you will normally not use the grid or Piano roll to trigger them.